The City of Pittsburgh is comprised of 90 distinct and historically inviting neighborhoods. 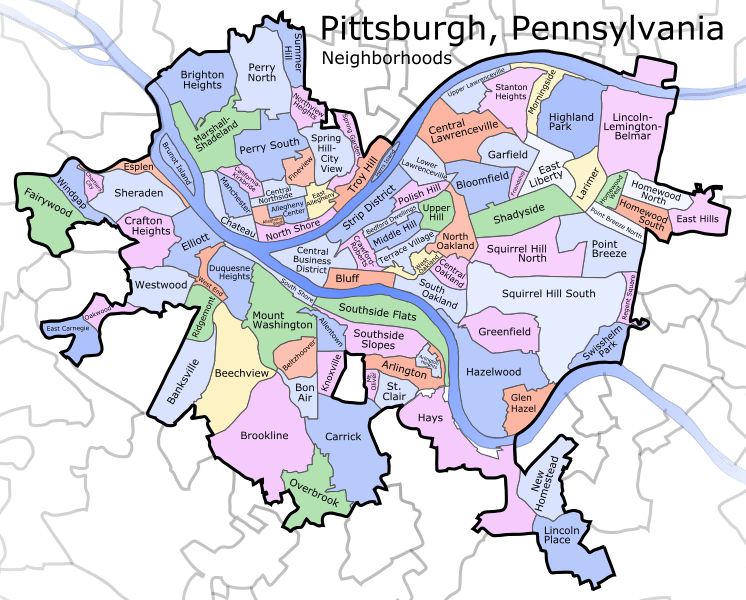 There are also many suburban townships and municipalities surrounding Pittsburgh, making up the greater Pittsburgh area and marking Western Pennsylvania as one of the great melting pots of America. Find your Pittsburgh Neighborhoods below and follow the link for a little slice of history and some cool pictures of the area. Pittsburgh has a rich and inviting history, and each of the Pittsburgh Neighborhoods in this section offers it’s own exciting story. The first settlers to the area in the 1700’s, through the forging of America and the emergence of the Steel City; Pittsburgh Neighborhoods offer an exciting American story! We are adding more neighborhoods over time, so if you don’t see your Pittsburgh neighborhoods in the list… stay tuned… it will be added! Looking for a neighborhood not within Pittsburgh’s city limits? Check out below!